For years I tried to find a motif embodying the City of Los Angeles for me. 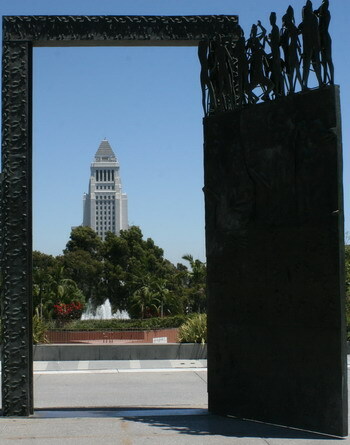 The bronze sculpture, created by Graham in 1978, was donated to the Music Center in 1982 by Frederick and Marcia Weisman. For me this vista is Los Angeles at its best. The old (City Hall) framed within the new (modern art) creates a view of a sprawling municipality which combines, by use of frame, space and distance, a perfect relationship. I found “my” view of the city. On the 4th of July weekend. Coincidence? The first time I visited LA was in 1965. There were still lots of orange groves along the highways south of LA. For me, LA will always be orange groves. There are still huge orange groves, but not around L.A. any longer. Nearly all fruit growing is done in the Central Valley by now. Interestingly enough people often have an orange tree in the garden – and do not eat the fruit! They buy their oranges at the supermarket.